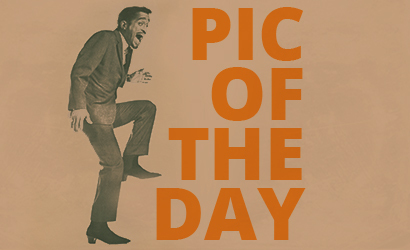 The year 2017 marks the 50th anniversary of the first man of colour to appear on the cover of GQ magazine: Sammy Davis, Jr. appeared on the cover of the September edition in 1967. It would take a further 10 years for the second, Swiss-Nigerian Urs Althaus in November 1977. GQ had begun life as Apparel Arts trade magazine in 1931. It become available to the public in 1958 as Gentleman’s Quarterly. Popular as an arbiter of taste and style in men’s fashion, the magazine sold so well that it was published monthly from 1970. 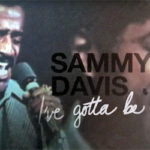 Others who had graced the cover by the time Sammy did in 1967 included Louis Jourdan, Cary Grant, John F. Kennedy, Fred Astaire, Henry Fonda and Sean Connery. 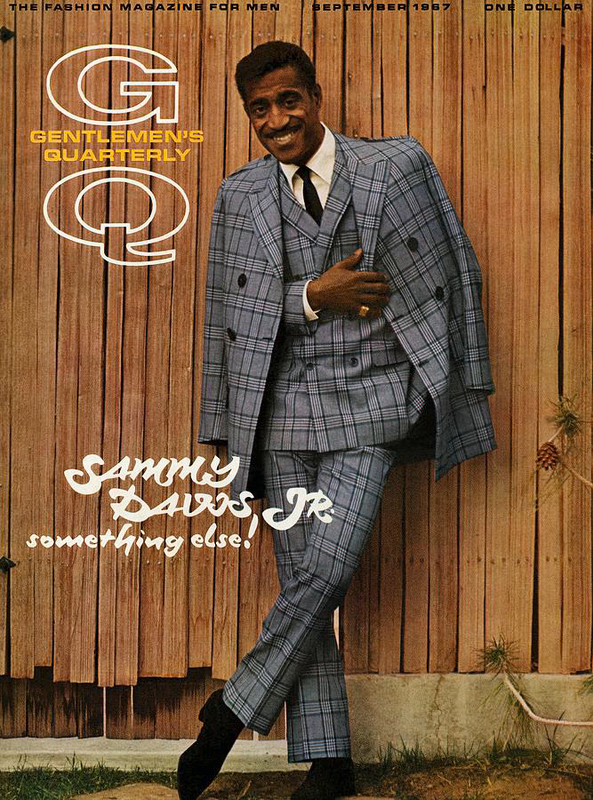 Sammy appeared wearing a Sy Devore vested double-breasted suit of grey plaid with a slim black tie, accompanied by the tagline ‘something else!’ The photo was taken by Milton H. Greene, the celebrity photographer famous for his work with Marilyn Monroe, who by this stage had worked with Sammy for over a decade. 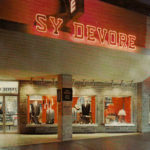 Sy Devore was Sammy’s tailor of choice, as he was for much of Hollywood at the time. Born Seymour Devoretsky in Brooklyn to Russian immigrant parents, Devore opened his first shop in 1930 in the heart of the New York theatre district while acting as road manager for the Andrews Sisters. He opened a store at the intersection of Sunset Boulevard and Vine Street in Hollywood in 1944. 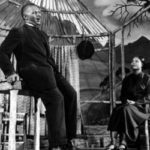 Devore loved show-business and knew how to host a party – some considered him more showman than haberdasher. Sy and his brother Al even bought Los Angeles nightclub Slapsy Maxie’s in 1947, just a year after The Will Mastin Trio Starring Sammy Davis, Jr. had gotten its big Hollywood break there. 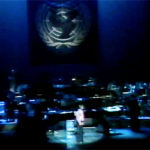 This brought him to the attention of the big stars of the day – Jerry Lewis, Dean Martin and Frank Sinatra, among others. 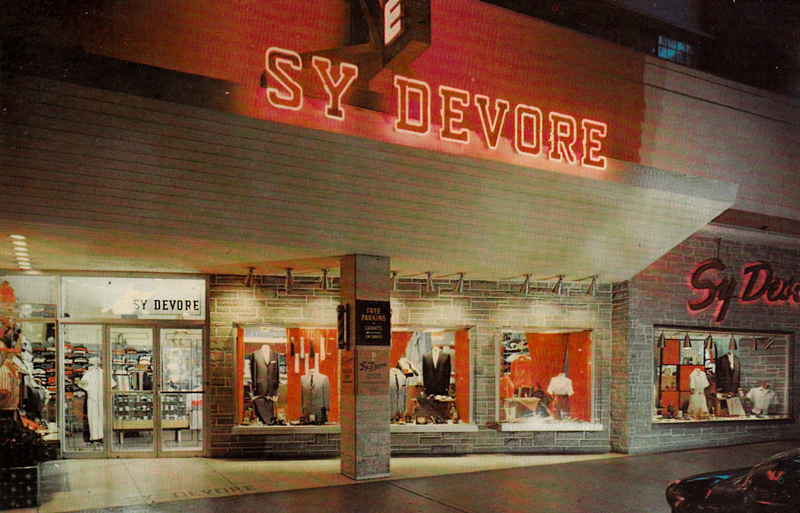 Throughout the 1950s and 1960s, Sy Devore ensured his store was a place for the big stars to meet and hang out, and not just a place to buy their suits. 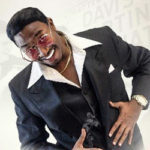 It is said that in 1965, Sammy placed a $30,000 order for 84 suits of various hues to be worn on The Sammy Davis, Jr. Show, given the show would be broadcast in colour.